K. Alex Müller received the PhD in Physics at the Swiss Federal Institute of Technology in 1958. After spending five years with Battelle Institute in Geneva as a project manager, he joined IBM Zurich Research Laboratory, Rüschlikon, Switzerland in 1963, where he continued to work in solid-state physics. K. Alex Müller was appointed Lecturer in 1962, Titular Professor in 1970 and Professor of the University of Zurich in 1987. He is the author of over 200 technical publications and member of the Executive Committee of the Groupement Ampère and the Ferroelectricity Group of the European Physical Society. He is also Fellow of the American Physical Society, member of the Swiss Physical Society and the Zurich Physical Society which he presieded in 1968/69. He was Manager of the Physics Department of the IBM Zurich Research Laboratory from 1973 to 1985. In April1982 he was appointed IBM Fellow. Since summer 1985 he has devoted his time exclusively to research with his own fellowship group. His present interests are fundamental aspects in the discovery of a high-Tc superconductor. In June 1987 Professor Müller received the honorary degree of Doctor of Science of the University of Geneva, Switzerland, in July that of the Faculty of Physics of the Technical University of Munich, West Germany, in November that of the Università degli Studi di Pavia, Italy, beginning February 1988 that of the University of Leuven, Belgium, on February 11, 1988 that of the Boston University, on May 29 that of the Tel Aviv University, Israel, on November 15, 1988 that of the Technical University of Darmstadt, West Germany, on March 8, 1989 that of the University of Nice, France, on May 12 that of the Universidad Politecnica, Madrid, Spain, on June 28,1990 that of the University of Bochum, FRG, and on November 12 that of the Università degli Studi di Roma, Italy. At the beginning of May 1989 Professor Müller was appointed Foreign Associate Member of the Academy of Sciences of the United States. On occasion of the 2nd International Superconductivity Symposium in Tsukuba, Japan, he received the Special Tsukuba Award on November 15, 1989. Together with Dr. J. Georg Bednorz, he is corecipient of the Thirteenth Fritz London Memorial Award 1987 (presented by the Fritz London Memorial Award Committee, University of Califomia, Los Angeles); the Dannie Heineman Prize 1987 (awarded by the Minna James Heineman Stiftung, Academy of Sciences Gottingen, West Germany), and the Robert Wichard Pohl Prize 1987 (conferred by the Prize Committee and the Steering Committee of the German Physical Society); the 1988 Hewlett-Packard Europhysics Prize; the Marcel-Benoist Prize 1986 conferred by the Marcel-Benoist Foundation, chaired by Flavio Cotti, Member of the Federal Council; the Nobel Prize in Physics 1987; the 1988 APS International Prize for New Materials Research, and the Minnie Rosen Award, conferred by the Ross University, New York. 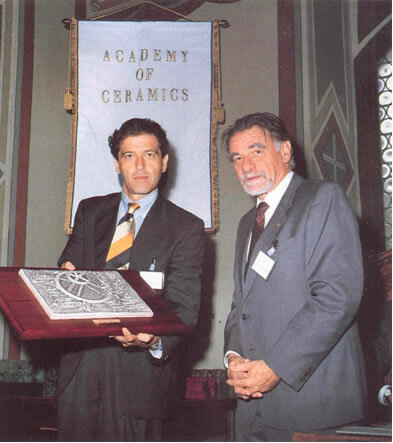 In 1992 he has been appointed Distinguished Member of the World Academy of Ceramics. a free interpretation of the Academy logo is the work of Carlo Zauli and Remo Tampieri.